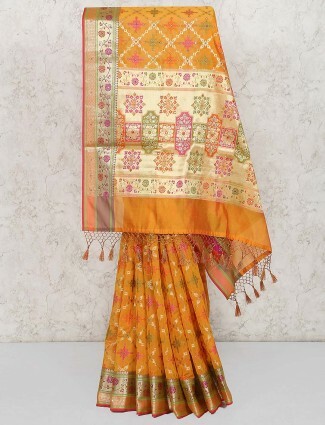 Indian wedding sarees collection are not just limited to traditional sarees, but also have a trend set from heavy designer wedding sarees with lehenga saree or a half and half sarees to match the theme of a wedding or a personal need. 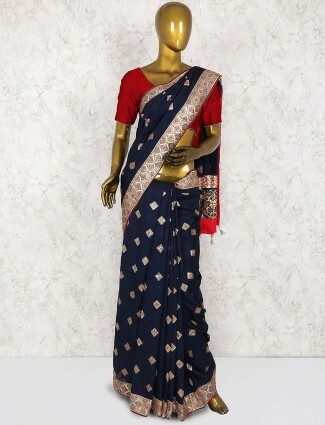 G3fashion.com wedding sarees collection is available in new styles from designer concepts of embellishment details, to matching saree blouses, to silks sarees for a wedding is what will catch your attention. 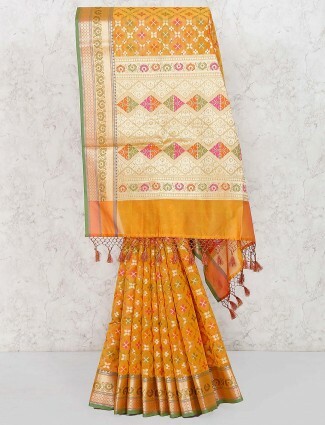 Wedding sarees in Patola silk, Paithani silk sarees, half and half net sarees, heavy work sarees and much more are what you can find for all different wedding ceremonies. 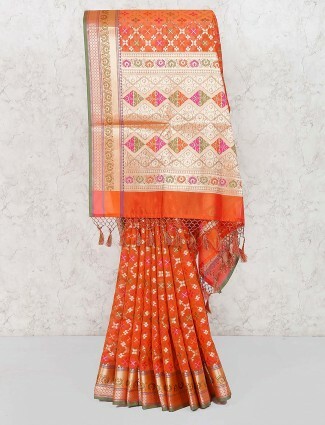 Wedding sarees for a closet is an essential Indian wear category that women would always want to try on new looks and look their desi best at Indian weddings. 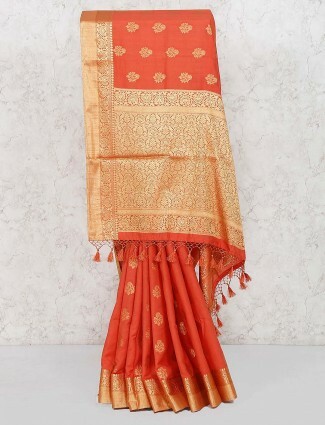 Whether you are attending a wedding as a wedding guest, or you yourself are the bride or family of the groom or bride you will need wedding sarees to style at the function. 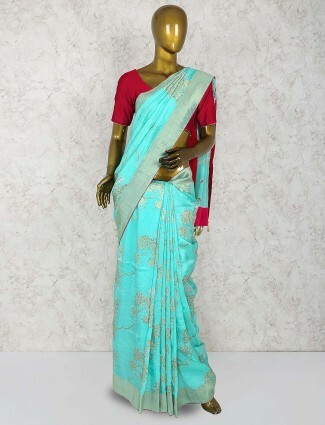 When it comes to wedding saree shopping for women, they normally know what kind of saree they want to buy or at least have an idea of the wedding sarees images as their reference that’s most got from Bollywood, celebrities or style looks that trend in fashion. 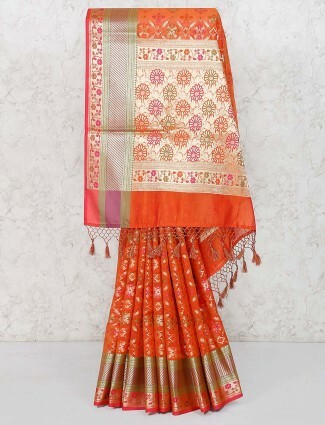 Shopping at G3+ fashion is one place where we keep all latest styles of wedding saree designs which are available in all price ranges from budget weddings sarees to Indian bridal sarees in premium range. 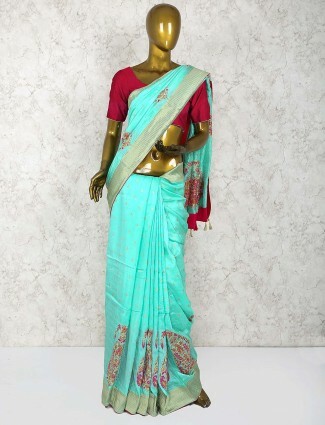 G3+ online wedding silk sarees are the most demanded and trending styles which any lady would want to possess. 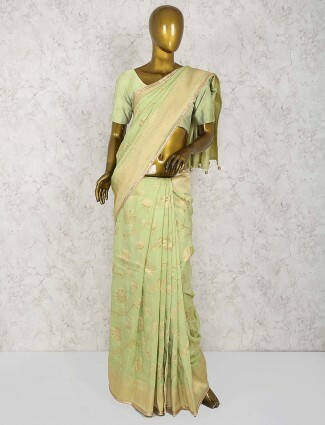 Silk sari for weddings which start from plain weave styles to embroidered silk sarees which are widely worn by women for wedding occasions. 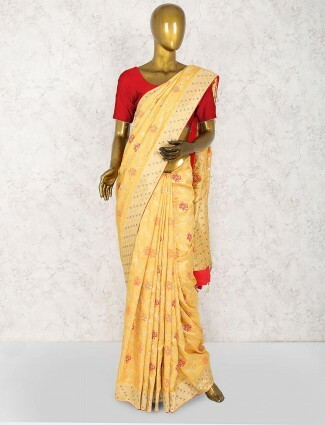 Our Collection of Bridal sari with price will match a bride’s choice of shopping for her sarees to wear at Pheras, Reception or even Sangeet or haldi. Shopping for Bridal Kanjeevaram sarees or Banrasi saree for brides is something which will give you stunning options in a huge variety of new motifs and concepts of sarees. 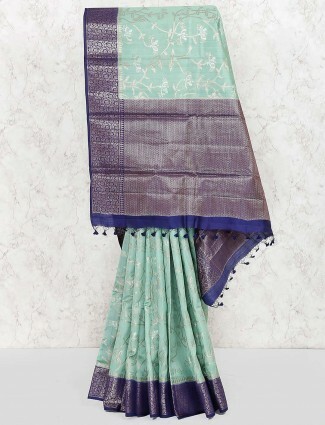 The new trend of dressing for theme weddings as wedding guest or bridesmaids’ sarees, G3fashion.com is the one place to shop for the collection in a large quantity to dress for a theme wedding. We offer stylish georgette sari, wedding net sarees, wedding saree gowns, pre-stitched sarees, wedding lehenga sarees, satin or crepe work border sarees for wedding parties and much more. Go for the Half and half wedding saree which are now back in trends of lace, velvet, satin, and silk weaves. 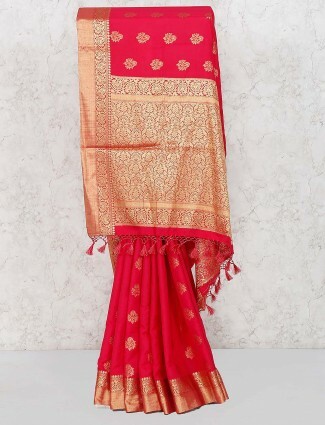 You can always find a the latest wedding sarees at g3fashion.com which are top designer sarees for wedding reception with price options you can choose to wear for a budget price as a wedding guest or the sister of the bride or groom. Saree gowns are your top options for wedding sarees for a reception and can be a perfect designer concept to flaunt those desi curves at Indian weddings. 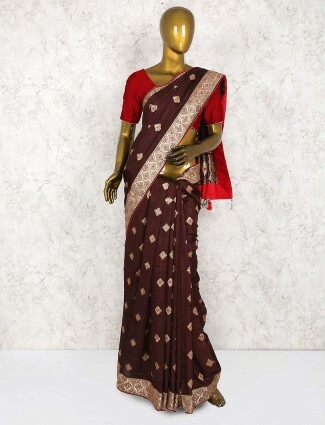 Go for Net sarees with the sequin work, zarosi work, diamond work, which will work well for a designer sarees in grey, black, white, gold, beige, red and many other trending saree colors for wedding reception. 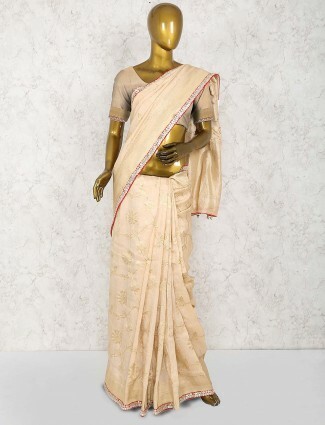 You can also go all traditional with wedding party silk sarees in gold or semi weaves to embroidered silk sarees. 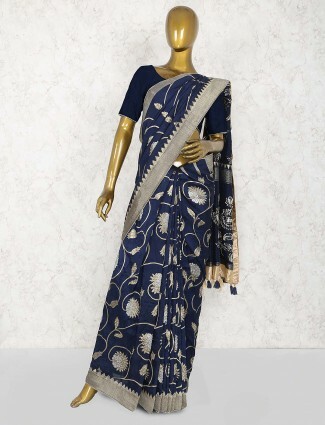 Designer sarees for wedding party designs can be in minimal style concept of stylish buttas on shoulder or pallu, or just the stylish tassels giving the fashion element to the wedding party sari. Go for plain silk weave sarees in banarasi silk or kanjivaram silk for a modern yet traditional avatar for wedding parties. 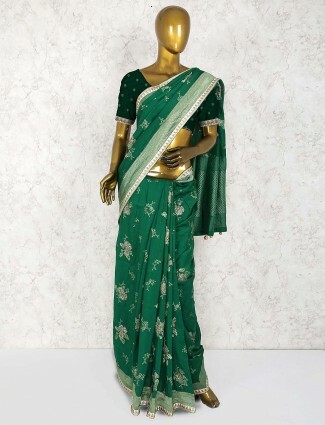 Choose a designer saree blouse to pair up the designer sari which matches the right look when combined together. We have a huge array of designer blouse designs in sleeve designs, neckline patterns, fabric choices, embroidered detail look to colors in all sizes which can be customised as well with G3fashion online shopping. 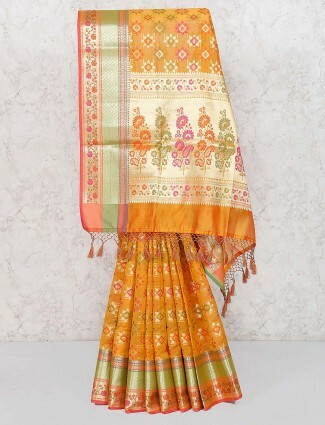 Half and half wedding sarees are styles of sarees every lady can afford and must have which can be in most trending and evergreen combinations of colors and fabrics. 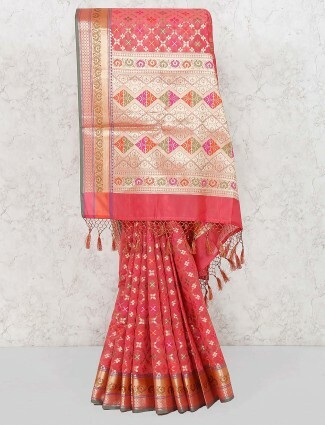 Go for net and georgette half and half wedding sarees where there is work on lower pleats on the net and scattered buttis on shoulder drape. 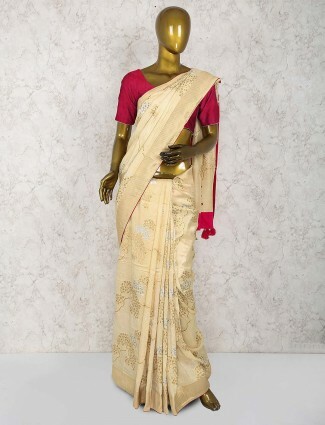 Go for white work saree in half of sarees and plain fabric on other saree portion. Velvet saree in half and half is perfect with dark colors like wine, navy, and bottle green or black for weddings is in huge trend right now. 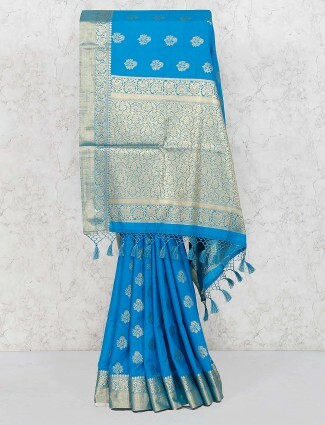 Shopping wedding sarees online at G3+Fashion will give you a variety of sarees in all different styles and prices for the bride, for bridesmaids, for wedding guest sarees, for the mother of the bride and groom as well. 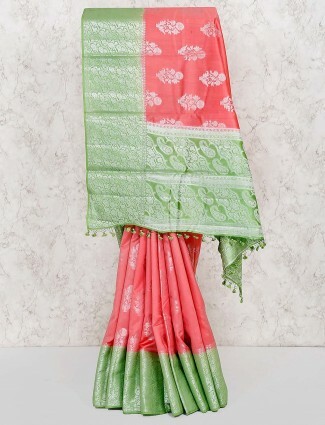 We give 100 percent original products of G3+ exclusive sarees which are from our G3+ Store and are uploaded on our website, to shop from anywhere around the world and get benefit of bets quality of sarees.